Studying Chinese is leading students from an Italian Chinese-language international scientific high school into a new world, as the oriental language is opening a new window for them to know more about China. The Chinese-language international scientific high school, located at the fourth floor of the boarding school Rome Convitto Nazionale Vittorio Emanuele II, is the only public high school that lists Chinese as a compulsory course in Italy. It also has Italy’s largest Confucius Classroom. Posters made by the students can be seen on the wall of the school corridor. Filling with Chinese culture elements, these posters present a beautiful picture together with the peach blossoms of the schoolyard in early March. Paolo M. Reale, president of the Rome Convitto Nazionale Vittorio Emanuele II, and eight students of the school wrote a letter to Chinese President Xi Jinping before the Chinese leader’s upcoming state visit to Italy, expressing their willingness to promote friendship between Italy and China. “The students are eager to share their experiences in learning Chinese language with President Xi Jinping,” said Reale, adding that the students are very enthusiastic about China and its culture. Immersive learning, summer camps in China and short-term overseas study tours have brought them closer with China, which further increased their passion for the country, Reale told People’s Daily. In the letter to the Chinese President, the students expressed their willingness to work hard to promote dialogue of minds, cultural exchanges, and mutual learning with their Chinese peers. 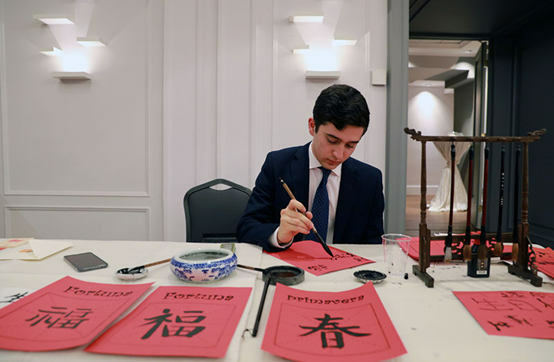 Alesslo Treggiari, a fifth-grader from the school and also one of the eight students writing the letter, told People’s Daily that learning Chinese has broadened his horizon, and helped him build the habit of thinking from a global perspective. He plans to come to China for graduate study and work for Chinese enterprises when he returns home. “Learning Chinese has guided us into a new world,” said Giovanni Stoppoloni, also a 5th-grade student. He told People’s Daily that he always wanted to know more about China when he learned Chinese. Last year, the boy went on a study tour to Shanghai with his classmates and witnessed the development achievements and vitality of the oriental country. He was impressed by the vastness and splendor of the world. “I wrote a poem for President Xi to share my Chinese learning experiences in the past 5 years. In the poem, I used a metaphor to describe how China adheres to virtuous traditions and sticks to innovative development,” he said. Stoppoloni believes that his future will be closely linked with China. The Chinese-language international scientific high school under the Rome Convitto Nazionale Vittorio Emanuele II is one of the 6 Confucius Classrooms affiliated to the Confucius Institute at Sapienza University of Rome. Thanks to the high-quality education, each year half of the school’s students would pass the level 5 exam of the Chinese Proficiency Test even before they graduate. In the past 10 years since its establishment, the number of students at the high school increased from 28 to over 250 in 5 grades. A total of over 100 students from the school have studied in China self-funded for 6 to 12 months, and about a dozen of the school’s graduates have been admitted to Chinese universities. “Only by learning languages can the students better understand other cultures,” said Reale, noting that the notion of the high school is to introduce Chinese culture to more young Italians, develop a global perspective for the students and let them become ambassadors of Italy-China friendly cooperation and East-West cultural exchange. Because of the continuous social and economic development of China, more Italians are willing to strengthen all-round cooperation between Italy and China and make good use of China’s development opportunities to develop themselves, said Reale. Last Christmas, Reale received an greeting card sent from Shanghai by former Italian Foreign Minister Angelino Alfano. The former diplomat expressed his gratitude toward Reale for making his child fall in love with Chinese culture through learning Chinese at the high school. Alfano’s child later decided to go to China for study. Reale introduced that Chinese courses were well-received by local people and boosted their confidence. He said the school will actively share teaching experiences with its peers to further promote Chinese teaching in Italy, and make new contribution to Italy-China cultural exchange.